Sometimes you just walk into something that is just too cool. I am sitting in the Press Box at the Burlington Bees game and I’m working on my story about Donnie Hissa, rookie pitcher from Northern Wisconsin. The game starts between the Bees and the Peoria Chiefs. I notice a guy behind the first base dugout. He is dancing; and, dancing very well. I ask Susan Denk, a sports reporter for The Hawk Eye newspaper, “Who is that?” She says “Oh, that is Dancing Bobby”. I get up and go talk to this guy! 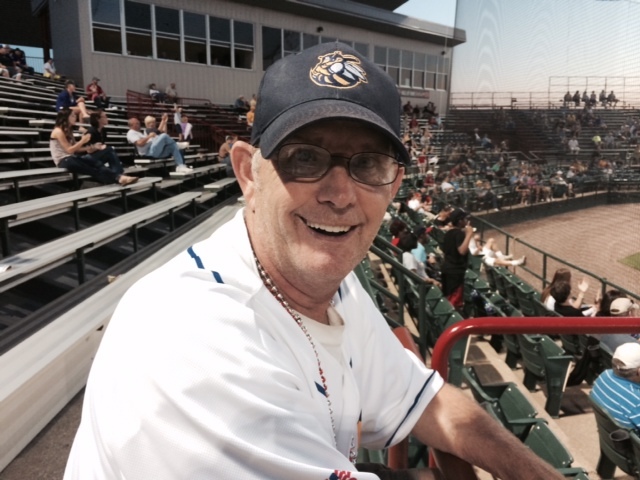 Bobby has been coming to Burlington minor league baseball games for over 30 years he tells me. He is 55 years old and says he only misses one game a year and that is when he is at Camp Eastman in Illinois. He is an Eagle Scout in the Boy Scouts and Camp Eastman is his vacation. His favorite team is the Bees and, also, the St Louis Cardinals. “They aren’t doing very good this year, they’re three out now (of first place)” Bobby volunteers. I tell him I am a Milwaukee Brewers fan, his face immediately goes into his palm, he laughs again with a big toothy grin on his face. Bobby is a fan favorite and people stop to say hello. I walk to the concession stand and talk to a lady named Amy who is working. She tells me Bobby has a brother named Charlie, who also works around the stadium, but he doesn’t dance. But Bobby -“He is a fixture around here, if he isn’t here something is wrong; but, Bobby is always here though” Amy says. “First time I start here, I am a bat boy”, Bobby stated, he is proud of this fact. The music starts playing and Bobby starts dancing, some kids join him. He enjoys the interaction. The kids look on in wonderment and try to keep up; they can’t. “I like it here. It is like my second home here”, Bobby continues when the music stops. During the off season, Bobby goes to basketball and football games. He doesn’t work at them but fans ask him to dance; so, “I do”, he laughs and loves the attention. He makes extra money mowing grass for the old people. “That one family I have been doin’ for 14 years” he motions to somewhere over the outfield wall and he laughs again. He tells me he is still waiting on a girlfriend, he really wants one, “I will get one, I am really nice”, he says hopefully. He bends over and retrieves two “Dancin’ Bob” cards from his Zip Lock baggie and walks over to two women. He gives each his card and walks back smiling – we fist bump. I go down by Bobby a few times throughout the game. Kids come and go, he gives them his card, but most don’t know what to make of him. I am told he was in the movie “Sugar” a couple of years ago. 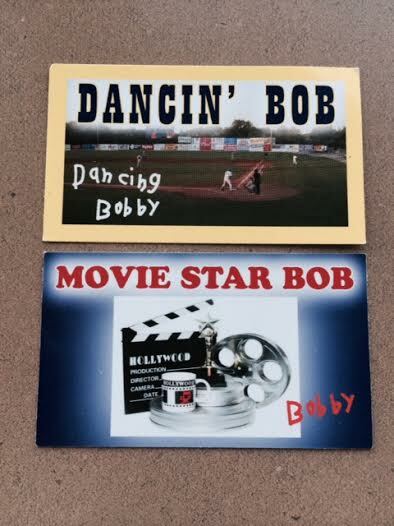 That explains the other side of his “Dancin’ Bob” card, which states “Movie Star Bob”. I ask him about the movie. “Yep, I am a movie star” he says nonchalantly. He smiles that big toothy grin again, I laugh, and he laughs along with me. At the end of the night, he is showing some young girls, who are under ten years old, some dance moves, they are keeping up. It’s hard not to smile when you are around Bobby. He invites you to be happy for the sake of being happy. I love your laugh and smile Bobby. Keep doing what you are doing, my life is better by just meeting you! UPDATE: It has come to my attention that Susan Denk has passed away, I send my condolences to her family. If you enjoy this story and you would like to help me complete the “Baseball in America Tour 2014″, which is roughly 265 days, please click on the following link to see how you can help at www.baseballbuddha.com. Follow me on Twitter and like my Facebook page! Please share this on your Facebook page and Twitter. I appreciate all the help I can get! at the time i was 14, i went to a burlington bees game and he gave me a CARD WITH A PICTURE OF HIM AND ITS SIGNED BY HIM WHAT A LEGEND!!!! Thanks! I really enjoyed him. One Vince would have been more entertaining to have at Bees games than any amount of Dancing Bobby(s). RIP Vince. I have known Bobby since the 70’s, when we all went to the Bees games. I grew up in Burlington and enjoy seeing him every time we go back. He always has a smile, a hug and a big hello for me and my family. He didn’t always dance in the beginning, but was always involved with the happenings at the ballpark. I hope he keeps on dancing for many more years. Bobby is the BEST….I am the “Gate Lady” for the Bee’s and I can’t wait to get my fist bump from him every home game! He smiles, then struts away to dance.